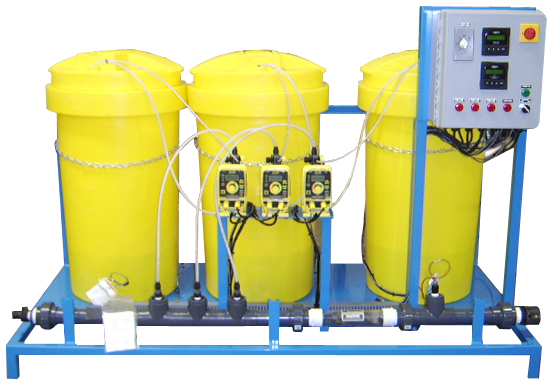 Mineral Injection Water Treatment Systems - Water Treatment Minerals | Applied Membranes Inc. Applied Membranes mineral injection systems are designed to inject minerals in to drinking water. One to four minerals can be injected at one time. The systems are designed for flow rates from 1 to 30 gallons per minute. Larger flows are possible by adding the increased line size option below. A typical system would inject three minerals: calcium, potassium and magnesium. The injection systems meet all IBWA, FDA and health code requirements. Example: Y-CHEMSK3-116 = 110v / 1 ph / 60 hz. AMI Mineral Injection Water Treatment Systems are Designed to inject minerals such as calcium, potassium and magnesium into drinking water.